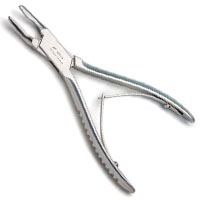 Rongeurs are like pliers with a heavy, pointed jaw. They are used for gnawing holes in bones during surgery. These German rongeurs are manufactured from the finest German steel.